The Royal Swedish Academy of Sciences has decided to award the 1997 Nobel Prize in Chemistry with one half to Professor Paul D. Boyer, University of California, Los Angeles, USA, and Dr. John E. Walker, Medical Research Council Laboratory of Molecular Biology, Cambridge, United Kingdom for their elucidation of the enzymatic mechanism underlying the synthesis of adenosine triphosphate (ATP) and with one half to Professor Jens C. Skou, Aarhus University, Denmark for the first discovery of an ion-transporting enzyme, Na+, K+-ATPase. The three laureates have performed pioneering work on enzymes that participate in the conversion of the "high-energy" compound adenosine triphosphate (ATP). Paul D. Boyer and John E. Walker receive half the prize for their work on how the enzyme ATP synthase catalyses the formation of ATP. Boyer and his co-workers have proposed, on the basis of biochemical data, a mechanism for how ATP is formed from adenosine diphosphate (ADP) and inorganic phosphate. Walker and his co-workers have established the structure of the enzyme and verified the mechanism proposed by Boyer. Jens C. Skou receives his half of the prize for the discovery of the enzyme sodium, potassium-stimulated adenosine triphosphatase (Na+, K+-ATPase). This enzyme maintains the balance of sodium and potassium ions in the living cell. Both enzymes are bound to membranes in the cell and linked with the transport of ions through these - but for different reasons. The German chemist Karl Lohmann discovered ATP in 1929. Its structure was clarified some years later and in 1948 the English Nobel laureate of 1957 Alexander Todd synthesised ATP chemically. An important role was that played by the 1953 Nobel laureate in Medicine Fritz Lipmann when he during the years 1939-41 showed that ATP is the universal carrier of chemical energy in the cell and coined the expression "energy-rich phosphate bonds". ATP functions as a carrier of energy in all living organisms from bacteria and fungi to plants and animals including humans. ATP captures the chemical energy released by the combustion of nutrients and transfers it to reactions that require energy, e.g. the building up of cell components, muscle contraction, transmission of nerve messages and many other functions. ATP has been termed the cell's energy currency. Adenosine triphosphate (ATP) consists of the nucleoside adenosine linked to three phosphate groups. On removal of the outermost phosphate group, adenosine diphosphate (ADP) is formed while at the same time the energy released can be employed for other reactions. Conversely, with the help of energy, an inorganic phosphate group can be bound to ADP and form ATP. Considerable quantities of ATP are formed and consumed. At rest, an adult converts daily a quantity of ATP corresponding to about one half body-weight, and during hard work the quantity can rise to almost a ton. Most of the ATP synthesis is carried out by the enzyme ATP synthase. At rest Na+, K+-ATPase uses up a third of all ATP formed. During the 1940s and 1950s it was clarified that the bulk of ATP is formed in cell respiration in the mitochondria and photosynthesis in the choroplasts of plants. In 1960 the American scientist Efraim Racker and co-workers isolated, from mitochondria, the enzyme "FoF1ATPase" which we now call ATP synthase. The enzyme can be divided into an F1 part containing the catalytic center and the Fo part coupling the F1 part to the membrane. The same enzyme exists in choroplasts and bacteria. In 1961 Peter Mitchell presented what is termed the chemiosmotic hypothesis for which he received the Nobel Prize in 1978. He showed that cell respiration leads to a difference in hydrogen ion concentration (pH) inside and outside the mitochondrial membrane, and that a stream of hydrogen ions drives the formation of ATP. The same applies to the chloroplast membrane. The coupling of ATP synthase to hydrogen ion transport takes place via the Fo part. Paul D. Boyer began his studies of ATP formation in the early 1950s and is still highly active as a scientist. His chief interest has been to find out by isotope techniques how ATP synthase functions and particularly how it uses energy to create new ATP. His work has been crowned with unusual success in the past few years. ATP synthase has a mode of function that is unusual for enzymes, and this required much time and extensive studies to establish. John E. Walker made his first studies of ATP synthase at the beginning of the 1980s. His starting point was that a detailed chemical and structural knowledge of an enzyme is required to understand in detail how it functions. He therefore determined the amino acid sequences in the constituent protein units. 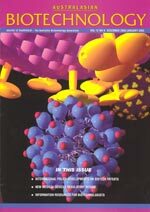 During the 1990s he has collaborated with crystallographers to clarify the three-dimensional structure of ATP synthase. So far, the structure of the enzyme's F1 part has been established. Walker's work complements Boyer's in a remarkable manner and further studies based on this structure demonstrate the correctness of the mechanism proposed by Boyer. As mentioned above, ATP synthase consists of a membrane-bound part, Fo, which transports hydrogen ions, and a protruding part (F1) which can be released from the membrane. (The terms are historical, and F1 stands for factor 1 and Fo for oligomycin-sensitive factor). Each Fo part consists of three types of subunits in differing numbers, the proteins a (1), b (2) and c (9-12). The F1 part consists of five subunits, alpha, beta, gamma, delta and epsilon. While there are three each of alpha and beta, there is only one unit of each of the others. It has been shown that it is on the beta units where the synthesis of ATP occurs. The analysis of the amino acid sequences that Walker and co-workers did at the beginning of the 1980s showed that subunits gamma, delta and epsilon are not symmetrical, a feature of importance for our understanding of how ATP synthase functions. The most detailed studies of ATP synthase concern the F1 part and how it functions. Boyer and co-workers clarified that the enzyme functions in a very particular way. They found that, as opposed to the view generally held, the step requiring energy was not the synthesis of ATP from ADP and inorganic phosphate, but that energy was required to bind ADP and the phosphate to the enzyme and to release ATP. Nevertheless an energy surplus was stored in the ATP. In this respect ATP synthase differs from the majority of all enzymes, which bind and release substrates and products spontaneously, but for which the overall catalytic reaction requires energy. A further observation was that despite the asymmetrical character of F1, there is only one way for the enzyme to react. But how then can the three beta subunits function in the same way if they have different couplings to subunits gamma, delta and epsilon? Boyer found the answer to this question by clarifying that gamma, delta and epsilon rotate in a cylinder formed of alternating alpha and beta subunits. This rotation induces structural changes in beta which lead to differences in bonding ability during a cyclical course. This mechanism is called Boyer's "Binding Change Mechanism". Boyer also proposed that this rotation is driven by the above-mentioned hydrogen ion flow through the membrane. Boyer has called ATP synthase a molecular machine. It may be compared to a water-driven hammer minting coins. The Fo part is the wheel, the flow of protons is the waterfall and the structural changes in F1 lead to three coins in the ATP currency being minted for each turn of the wheel. Walker clarified the structural conditions of the enzyme's molecular machinery and thereby verified Boyer's mechanism. The crystallographic structure of the F1 part of ATP synthase from cows, determined chiefly in collaboration with the Dutchman J.P. Abrahams and the Englishman A. Leslie, shows partly that the alpha and beta subunits are related in terms of structure and evolution and partly that they have clearly differing structures and therefore differing abilities to bind ADP and ATP. The gamma subunit is placed as an asymmetrical axle in the cylinder formed by the three alpha and the three beta subunits and has unique contacts with the beta units and forces their active surfaces to assume different three-dimensional structures. These results can be interpreted according to Boyer's mechanism to mean that the enzyme functions through rotation of the gamma subunits. It has been difficult to demonstrate this rotation experimentally but several groups have now succeeded. Wolfgang Junge in Germany used spectroscopic techniques and the American scientist Richard Cross chemical cross-bonding. Recently a Japanese group under Masasuke Yoshida succeeded in visualising the rotation in the F1 part of ATP synthase. They attached a fibre of the muscle protein actin to the gamma subunit, and the beta units were attached to the substratum. Depending on the ATP concentration in the surrounding liquid it was possible to show under a microscope how the actin fibre rotated at increasing speed with increasing ATP concentration. It was known as early as the 1920s that the ion composition within living cells is different from that in the surroundings. Within the cells the sodium concentration is lower and the potassium concentration higher than in the liquid outside. Through the work of the Englishmen Richard Keynes and Alan Hodgkins at the beginning of the 1950s (Hodgkins received the Nobel Prize in 1963) it was known that when a nerve is stimulated sodium ions pour into the nerve cell. The difference in concentration is restored by sodium being transported out once again. That this transport required ATP was probable since the transport could be inhibited in the living cell by inhibiting the formation of ATP. With this as the starting point Jens C. Skou searched for an ATP-degrading enzyme in the nerve membrane that could be associated with ion transport. In 1957 he published the first article on an ATPase, which was activated by sodium and potassium ions (Na+, K+-ATPase). He was the first to describe an enzyme that can promote directed (vectored) transport of substances through a cell membrane, a fundamental property of all living cells. Numerous enzymes have since been demonstrated to have essentially similar functions. Skou used as experimental material finely ground crab nerve membranes. The ATP-degrading enzyme found in the preparation required the presence of magnesium ions and was stimulated with increasing quantities of sodium ions up to a certain limit. Above this Skou was able to obtain further stimulation if he added small quantities of potassium ions. An indication that the enzyme was coupled to the ion pump was that maximal stimulation was obtained at the concentrations of sodium and potassium that normally occur in the nerve. In his further studies of the enzyme mechanism Skou showed that sodium ions and potassium ions bind with high affinity to different places in the enzyme. In addition he showed that the phosphate group separated from ATP also binds to ATPase. This is described as a phosphorylation of the enzyme. The enzyme is dependent on sodium ions when it is phosphorylated and on potassium ions when it is dephosphorylated. Substances known to inhibit sodium/potassium transport are certain digitalis alkaloids, e.g. oubain, and Skou showed that oubain interferes in the enzyme's activation by sodium. The picture that slowly emerged from Skou's and others' work is that the enzyme consists of two subunits, alpha and beta. The first carries the enzyme's activity and the other presumably stabilises the structure. The enzyme molecules are located in the cell membrane, often in twos, and expose surfaces to the outside as well as the inside. Three sodium ions and ATP bind to the interior surface. A phosphate is then transferred from ATP to an amino acid in the enzyme, asparagine, whereupon the ADP is liberated and the enzyme changes form so that the sodium ions are transported to the outside. Here they are released and two potassium ions attach instead. When the phosphorus that is bound to the enzyme is removed the potassium ions are transported into the cell and when new ATP binds to the enzyme they are rejected. Since more sodium ions are transported out than potassium ions are transported in, an electrical potential is created across the membrane. This difference in potential across the membrane is a condition for a nerve stimulation to propagate along a nerve fibre or a muscle cell. This is why a shortage of nourishment or oxygen in the brain rapidly leads to unconsciousness since the ATP formation ceases and the ion pump stops. The pump is also important for maintaining cell volume. If the pump stops, the cell swells. The difference in sodium concentration between the interior and the exterior is the driving force in the uptake of important nutrients necessary to the cell, e.g. glucose and amino acids. It can also be used for transport of other ions through the cell membrane. Thus sodium ions that enter can be exchanged for calcium ions that exit. The latter is the mechanism that enables digitalis to strengthen heart activity. Following the discovery of Na+, K+-ATPase other ion pumps have been discovered with similar structures and functions. Examples are Ca2+-ATPase in skeletal muscle, which participates in the control of muscle contraction and H+, K+-ATPase which produces hydrochloric acid in the stomach. It is the latter enzyme that is specifically inhibited in modern treatment of stomach ulcers. Corresponding enzymes are also found in lower organisms, for example in yeast where an H+-ATPase secretes hydrogen ions formed during fermentation. As a common name these enzymes are nowadays termed P-type ATPases since they are phosphorylated during the course of the reaction. Boyer, P.D., The binding change mechanism for ATP synthase - Some probabilities and possibilities, Biochimica et Biophysica Acta (1993) 1140, 215-250. Abrahams, J.P., Leslie, A.G., Lutter, R., and Walker J.E., Structure at 2.8 Angstrom resolution of F1-ATPase from bovine heart mitochondria, Nature (1994) 370, 621-628. Boyer, P.D., The ATP synthase - a splendid molecular machine, Annual Review in Biochemistry (1997) 66, 717-749. Skou, J.C., The influence of some cations on an adenosine triphosphatase from peripheral nerves, Biochimica et Biophysica Acta (1957) 23, 394-401. Skou, J.C., and Esmann, M., The Na, K-ATPase, Journal of Bioenergetics and Biomembranes (1992) 24, 249-261. Lingrel, J.B., Na-K-ATPase: Isoform Structure, Function, and Expression, Journal of Bioenergetics and Biomembranes (1992) 24, 263-270. Moller, J.V., Juul, B., and le Maire, M., Structural organization, ion transport, and energy transduction of P-type ATPases, Biochimica et Biophysica Acta (1996) 1286, 1-51. Lutsenko, S. and Kaplan, J.H., Organization of P-type ATPases: Significance of structural diversity, Biochemistry (1996) 34, 15607-15613. Professor Paul D. Boyer was born 1918 in Provo, Utah, USA. Ph.D. in Biochemistry 1943, University of Wisconsin, Madison, USA. From 1963 to 1989 he was Professor of Chemistry at Department of Chemistry and Biochemistry, University of California at Los Angeles (UCLA), and from 1965 to 1983 Director of the Molecular Biology Institute, UCLA. Since 1990 he has been Professor Emeritus at Department of Chemistry and Biochemistry, UCLA. Boyer has been a member of the National Academy of Sciences since 1970. He received an honorary doctorate from Stockholm University in 1974 and in 1989 he was awarded the Rose Award of the American Society of Biochemistry and Molecular Biology. Dr. John E. Walker was born 1941 in Halifax, Great Britain. He received M.A. and Dr.Phil. at Oxford University, Great Britain. Since 1982 Walker has been Senior Scientist at the Medical Research Council Laboratory of Molecular Biology, Cambridge, Great Britain. He was elected to the Royal Society, London, in 1995. Professor Jens C. Skou was born 1918 in Denmark. He received his medical training at Copenhagen University. In 1954 Skou received his doctoral degree at Aarhus University, where he became Professor of Physiology in 1963. He was appointed Professor of Biophysics in 1977 at the same university. Skou is a member of the Danish Academy of Sciences. Copyright 1997 Australian Biotechnology Association Ltd.